Myanmar has opened its doors to the international community. It is now among the top Southeast Asian countries to visit that attracted more than 4.6 million tourists in 2015. It is more than a million tourist arrivals from the previous year that entered the country via land, sea and air. It is in my bucket list to visit the country doing a Thailand - Myanmar entry since there is no direct flight yet from the Philippines to Myanmar. The options I considered doing this travel is by land and air. However, browsing the internet of how the entry from Bangkok to Yangon be done is a bit time consuming. For atraveler like me, spending around 2 to 3 days in a country, it will be impractical to do the land travel. The other option I have is flying by a budget airline, it is just an hour fly from Bangkok to Yangon. I have chosen to fly round trip, by then, I am all set for the travel! Yangon International Airport is new, huge and pleasantly carpeted. Airport staff are courteous but a bit unable to express themselves in English. The only option to take from airport to the downtown area is to ride a taxi. Oh no, I really am thinking of doing a train or bus to save a bit from a tight budget of around US$60. (Exchange rate that time is 1228 Kyats: US$1) My US$60 is exchanged to almost 74,000 Kyats. Well, I have no choice but to take the taxi since a train option will be impossible since, according to the airport staff, no train service during night time. The driver speaks in English but not that clear. Well, we still manage to do the conversation while going towards my hostel. I am seated in front at the left side of the car since cars in Myanmar are mostly right-hand drive. Gladly, i arrived safely in my hostel at La Thar (La Tha) Township. I asked the help of my hostel receptionist on how to get to the airport from where we are. Aung-Aung, the name of the receptionist, is kind enough to write me the instructions in English and in Burmese. The bus option I can have is either bus number 51 and 135. He then said, I should get off at the '10 Miles' Bus Stop. I constantly asked if the bus stop is the final stop, and he frequently answered me with "YES". 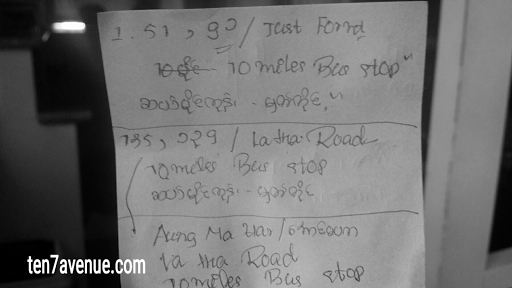 He also informed me that the fare is around 200-300 Kyats. 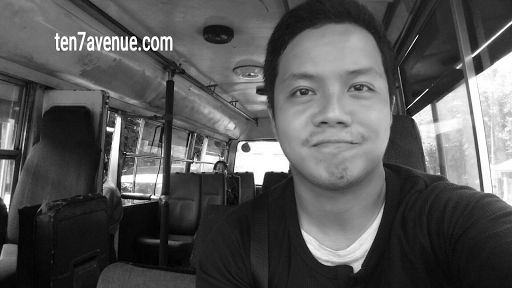 On board the bus, I paid for my fare with 1,000 Kyats and got a change of 300 Kyats. I did not argue anymore that my change is lacking since I cannot understand them. The bus ride is just an hour from La Tha Road to the airport. I frequently watch my map and observe the road we pass - great to know we are on track. Then, we pass the arch saying "Yangon International Airport" and I keep on looking where the bus stop is. Oh well, it is not really a bus stop. The bus stopped a kilometer away from where I saw the arch and it is not the final stop. 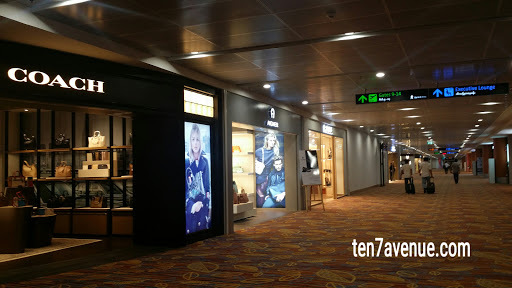 I walked and upon arriving to the airport arch, I saw the 10 Miles but not really a bus stop. One should take note of the arch and stop any point after the arch. From the arch, almost a kilometer walk is still to expect towards the airport. Oh yes, I am going back to Bangkok and catch the trip to Ayutthaya. It is a great experience in and out Yangon, Myanmar. Thank you for the experience! 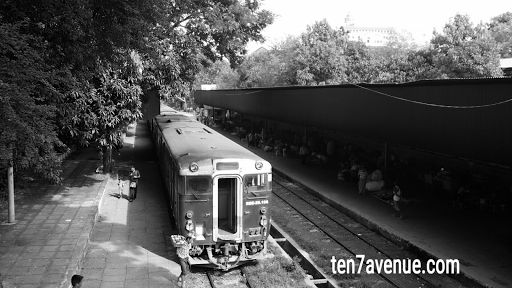 I hope you'll share your story too here in my avenue, www.ten7avenue.com.